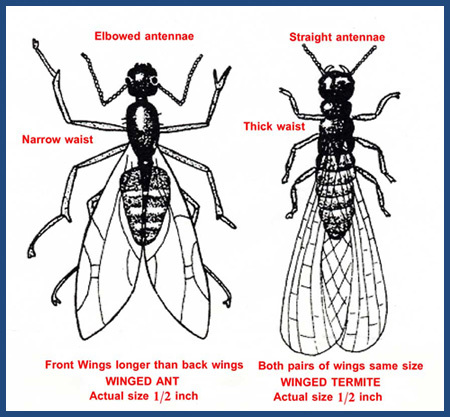 Advance Termite & Pest Control, Inc. has been providing quality termite treatments since 1985. Our certified applicators can prepare on-site estimates for termite control for the installation of the Sentricon™ Termite Colony Elimination System, the same system used to protect the White House, the Statue of Liberty, and other national treasures. Conventional treatments involve the application of a chemical termiticide liquid barrier soil treatment around the interior and exterior perimeter of the structure. This method may cause some inconvenience and generally will deteriorate within 5-7 years after application. Advance is also authorized to offer the Sentricon™ Termite Colony Elimination System from Dow AgroSciences, LLC, a service that avoids the inconvenience and odor of chemical treatments. Unsure if you're looking at an ant or termite? Download our quarterly newsletter to read about the latest hot topics related topest control and keeping your home safe from infestation. Need to Identify a Bug? The National Pest Management Association's Pest Guide has the answers for you! Connect with us on Facebook to support Advance!